Heat oven to 350°F. Brush 2 large cookie sheets with canola oil. Unroll crescent dough; separate into 4 rectangles. Firmly press perforations to seal. Brush rectangles with 1 tablespoon of the sesame oil. Top each rectangle with 3 tablespoons green onion; sprinkle with pepper. Starting with 1 long side of each rectangle, roll up. Cut each roll into 3 pieces. Twist each dough piece into 4-inch rope. Lightly coil each rope into small bun. On floured work surface, press each bun into 3-inch round. Place 2 inches apart onto cookie sheets. 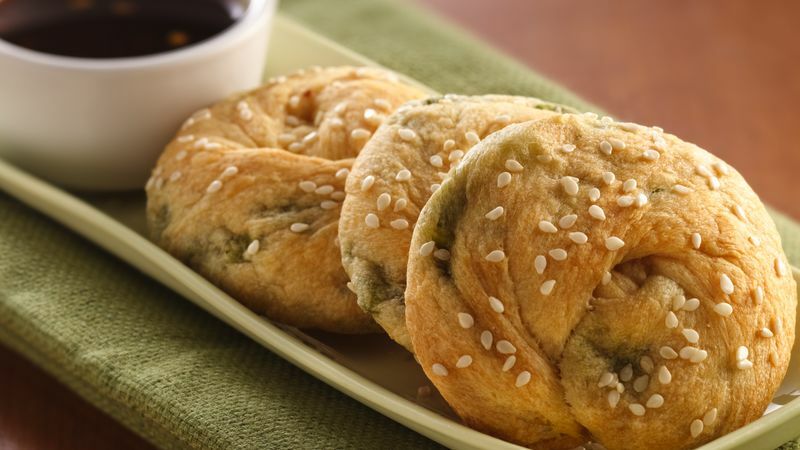 Brush buns with remaining sesame oil; sprinkle with sesame seed. Meanwhile, in 1-quart saucepan, heat spreadable fruit, water, soy sauce, ginger and vinegar over medium heat 3 minutes, stirring frequently, or until thoroughly heated; stir in red pepper. Transfer sauce to small serving bowl. Serve warm buns with sauce.